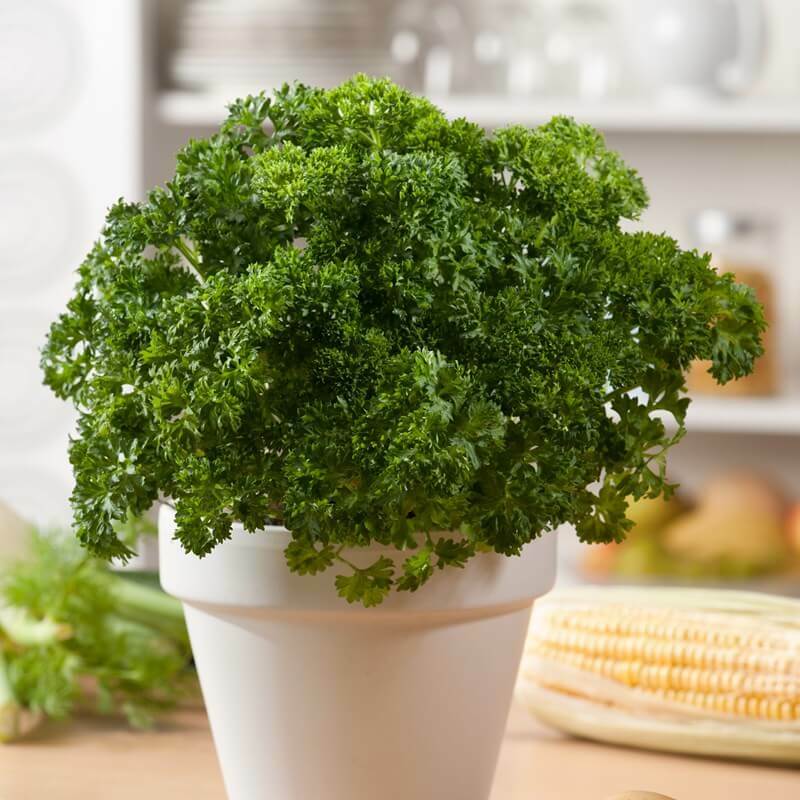 Parsley (Petroselinum crispum) is a bright green, biennial, herbaceous plant. It is a species of flowering plant in the family Apiaceae and widely cultivated as an herb, a spice, and a vegetable. Where it develops as a biennial, in the first year, it frames a rosette of tripinnate leaves 10–25 cm long with numerous 1–3 cm leaflets, and a taproot utilized as a food store over the winter. In its second summer, it grows a blooming stem to 30 inches tall with sparser leaves and flat-topped three to ten cm diameter umbels with various 2 mm diameter yellow to yellowish-green blooms. The seeds are ovoid, two to three mm long, with prominent style remainders at the apex. The plant normally dies after seed maturation. 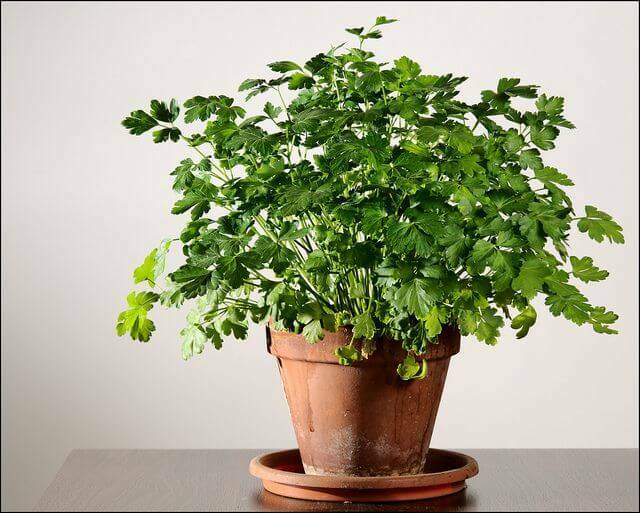 Common name: Parsley or garden parsley. It thrives best in Prefers full or part sun. It grows best in moist, well-drained soil and it likes a slightly acidic pH, around 6.0. It prefers a temperature ranging between 22 degrees celsius – 30 degrees celsius / 72 degrees fahrenheit – 86 degrees fahrenheit. Water regularly and moderately, always keep the soil moist but never allow your plant to sit in water. Do not allow soils to dry out between watering. Petroselinum crispum is a heavy feeder. Apply one application of dry organic fertilizer in the spring and monthly foliar feedings to ensure healthy growth. It is propagated by seed. Seed might be begun indoors about six weeks before last spring frost date. Seed may also be started outdoors in the garden as of last spring frost date. Germination takes 10 – 25 days but you can speed it up by soaking the seeds in warm water for a day before planting, but be careful not to overdo the heat and cook the seed. The seed stays viable in normal storage for two to three years. Harvest regularly to keep plants producing more leaves. Pick leaves anytime. Use them fresh or freeze. You can also dry parsley, although it tends to lose a lot of its flavor. For extensive amounts, cut up to half the leaves from the plant just above soil level. There is no serious insect or disease problems. However, But you may have to handpick an occasional caterpillar. The larvae of the black swallowtail butterfly is particularly fond of this herb. Bees and other nectar-feeding insects also visit the flowers Prevent plant diseases by choosing a site with good air circulation. Apply organic plant fungicides — copper, sulfur — early, when symptoms first appear. It is rich in minerals such as iron, magnesium, calcium, potassium, zinc, and phosphorus. It also contains high levels of folic acid and the vitamins A, B, C, and K.
It can be utilized to treat urinary infection, kidney stones and water retention problems and it can help menstrual issues. Chewing parsley after meals can help freshen breathe. It helps to relieve asthma and ease lung congestion and can help milk production in Mothers.